Little did I suspect, 30 years ago, when THE GUNSMITH #1: MACKLIN'S WOMEN came out, that it would be reprinted 30 years later--both as print and as an e-book. But here it is, appearing as of Oct. 2011. From that point on Gunsmiths will continue to appear until the first 200 are available as ebooks. #2 THE CHINESE GUNMAN will appear in Nov. In Dec. the first books in the ANGEL EYES and TRACKER series will appear, and then GUNSMITH #3: THE WOMAN HUNT in January. 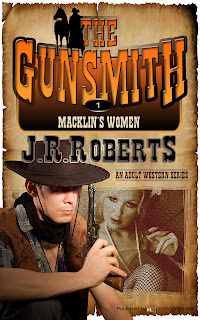 The Gunsmith books will continue to appear as by J.R. Roberts, but Angels Eyes, Tracker and Mountain Jack Pike series will appear as by Robert J. Randisi writing as . . . In any case, shared here for the first time, the cover of Gunsmith #1--which will also be the cover of the POD trade paperback, and the Audios which will appear in January and February. Congratulations on the relaunches, Bob. The new cover look is jim-dandy--I hope they sell like hotcakes. I recall this from ... I truly can't remember. (Let's not talk about years) If my old memory does not lie to me I believe I was impressed. I hope 10s of thousands of new readers are likewise impressed. I've been thinking eBook is the way to go and once I get a moment to realize there's a world around me I believe I'll arrange for that.